The fallout from this year’s Dota 2 International has affected nearly every top tier team. Teams have reflected on their recent performance, and made drastic changes to their team rosters to try and strengthen their future prospects. Many professional Dota 2 players have left their teams as a result of this great roster shuffle: Na’Vi’s own leader ‘Puppey’ announced his departure only last week. It’s not all bad news though. EG’s veteran player ‘Fear’ has returned to the squad in rather spectacular fashion. Clinton ‘Fear’ Loomis had to withdraw his place at this year’s Dota 2 International due to an injury, preventing him from playing. He instead took the helm as the teams coach, while stand in player ‘Mason’ joined the team to participate in the tournament. EG came in at 3rd place after a valiant battle against China’s finest teams, winning the team over $1 million dollars in the process. Shortly after the team respectfully bidded farewell to Mason in preparation for Fear’s return, who was still nursing his arm injury in a six-week recovery plan. Now the time has come for EG’s captain to return to the squad. 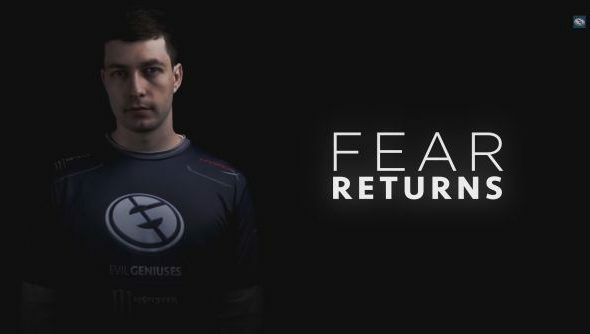 How do you think EG will perform now that Fear is back?